If you think your cell phone bills are out of control -- well, you have no idea. A study published earlier this year in the American Economic Review suggests smartphone owners might overpay on their monthly bill because of a U.S. industry policy that's actually supposed to help people save money. 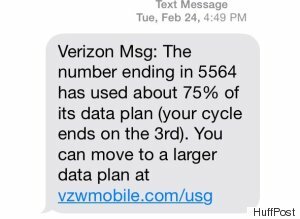 Under the policy, which went into effect in 2013, wireless carriers like Verizon and AT&T send text messages to customers to let them know if they're burning through their monthly data too quickly. The idea behind this practice is to prevent "bill shock," that horrible feeling you get when you look at your phone bill and see a much higher charge than you expected because you went over your plan. It's also supposed to warn customers to curb their data usage so they don't spill over their monthly limit. A sample notification indicating that a customer is about to go over her data plan. But cell phone companies are padding their subscription plans to make up for the fact that they have to warn customers about lucrative overage charges, according to study authors Matthew Osborne and Michael D. Grubb. "Cell phone companies make a lot of money from overage fees. If you implement these alerts, then they're going to lose money on that, so they're going to try to make up that money, in other words, by increasing fixed fees," Osborne, an assistant professor of marketing at the University of Toronto Mississauga, told The Huffington Post in a phone interview. "While [customers] get more information, they're paying more." Additionally, people aren't good at estimating their data usage ahead of time. So even if they get a warning message, they're still likely to go over their limit. It should be noted that the researchers looked at cell phone bill records from 2002 to 2004. While phones today let us access high-speed Internet, watch feature-length films, send high-quality photographs to large groups of people and so on, phones from 2002 to 2004 couldn't do much beyond place calls, send texts, play "Snake" or maybe store a limited number of MP3s. Billing at that time was based on minutes, rather than gigabytes of data. In other words, they examined a completely different beast than we're accustomed to. There's a good reason the authors used old stats, though: It allowed them to create theoretical models of the "bill shock" warning policy's impact in the real world and suss out different ways both consumers and companies could be affected. "While our 2002–2004 data are imperfect to directly resolve the policy question today, we use them to predict what effect the policy would have had," the study reads. The researchers found that keeping track of talk minutes was a challenge for people. "Our study implies that people basically underestimate how much they use their phone, and they underestimate by about an hour. If you think you're going to use 100 minutes, you actually go over by about 60 minutes," Osborne told HuffPost. It's easy to see how there would be a similar problem with modern-day data usage. Is it safer to pay $65 a month for up to 3GB, or should you bump that up to the next tier? What does 3GB mean in terms of everyday usage, anyway? How much data does it take to download a video a friend sends you? Make the wrong choice and you'll pay for it, because overage charges will mount. If you're on Verizon or AT&T, you can expect to pay $15 for every GB over your plan's limit. An hour of Netflix video can use up to 3 GB, so if you're using your phone's plan to watch a two-hour movie on a bus when you're at your plan's limit, you've potentially added $90 to your bill right then and there. And let's say you receive a warning message from your carrier telling you you've used 75 percent of your monthly data. In order for that to be helpful, you first have to remember which data plan you're on. (3GB, let's say.) Then, you have to do the math to figure out that you've basically used 2.25 GB of the 3 allotted. Finally, you have to adjust your behavior for the rest of the month to avoid an overage charge, or upgrade your existing plan to a costlier one that allows more data consumption. As the study notes, people probably won't do all of this, which means they're probably going to be stuck paying a fee, despite the warning from their carrier. "Overconfidence causes consumers to choose overly risky plans and underestimate the likelihood of paying overage charges," the study reads. "Some of these plans are tailored to exploit people's mistakes," Osborne told HuffPost. "That would be one place potentially for the government to step in, by having the cell phone companies provide people with more detailed statistics monthly."